Such an S-shaped curves pipe-lure during excavations on the territory of Denmark was found several dozens. Most of them date back to around the 8th century BC, that is, they appeared in Denmark long before the Viking Age. The most amazing thing - they can play so far. Probably, this is the only musical instrument of the same age, have not lost their functions. In the Viking Age Lurs were also used, but they were produced from wood, not bronze. By the way, one of the archaeologists found Lure in 1845, was donated by the Danish king Frederik VII Russian Tsar Nicholas I, she is now in the Hermitage. In old photographs, you can see that at first, at the opening of the columns in 1909, it was only one of the troubadours. 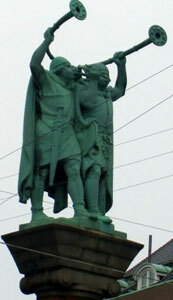 Two Viking appeared in 1914, a new project was to fund Carlsberg Siegfried Wagner and Anton Rosen. Do you know something interesging about Vikings Monument?